Hi Everyone. Today I wanted to take a moment to talk about a really exciting development with EmBraced In Comfort. For years now, I’ve been privileged to be able to help patients who are uncomfortable in their Scoliosis Braces to become more compliant in their braces through comfortable and functional undergarments. It’s been a pleasure and the rewards are plentiful. However, I’ve been inspired to do MORE for a long time now…I just was not sure what to do, until recently. Over the past year, I’ve developed two fitness-related products that I feel meet a need that has not been adequately addressed. So, I decided to launch a new line of fitness products for the non-brace-wearing population (as well as the brace-wearing population) 🙂 We plan to use this fitness line to help support small non-profits that are founded by parents searching for solutions for their children’s medical issues. I have always felt that, while the challenges involved in Scoliosis are neither trivial nor minimal, I am blessed that we don’t have any more serious, fatal illness to deal with. I have a real heart for parents trying to struggle daily to literally fight for their children’s lives. So, we plan to begin this process with the introduction of two new fitness products. First, we are introducing our “Protective Shoe Covers”, which cover and protect mesh running shoes from the wind, rain, and snow. Secondly, our unique “Fitness Belts”, which provide a stable, wraparound pouch, with pockets for phones, keys, tissue, water bottle, or a number of items. Ten percent of the retail sale price for these items will go to support our first non-profit, the “Save Our Boy Foundation”. The “Save Our Boy Foundation” was formed by a former high school classmate of mine and his wife, to raise funds to find a cure for Deuchenne Muscular Dystrophy. Deuchenne MD is a debilitating illness that affects 1 in 3,500 boys. It is 100 percent fatal, with most afflicted boys not living past the age of 20. Imagine that – facing a giant that is slowly pummeling your little boy, while time is quickly running out. That is a desperation I am grateful not to face and I hope that we can provide a tiny bit of support toward helping them meet a lofty goal. I wrote about this organization in November of 2009 “Looking Outside Ourselves”, and I want to sum up this article with a story that I mentioned in that post. I remember when Heinrich (the classmate mentioned above, whose son is afflicted with Deuchenne MD) was sitting near me in class one day and I got a paper cut. I said, in my teenage whiney girl voice, “Ouch – why is it that something so small hurts more than ANYTHING! ?” Heinrich just laughed and said, “Well, I think you’d feel differently if you had a big bullet hole in your chest.” Amen to that. Scoliosis is definitely serious and I say again and again that I do not minimize it (both my kids have it, after all!). However, I thank God every day when I look at my little boy, because if I had to choose Scoliosis over Deuchenne MD, I know what I would pick – it would not be the bullet hole! If you’d like to make a direct tax deductible donation to the Save Our Boy Foundation, you can go to their website at: www.saveourboy.org. 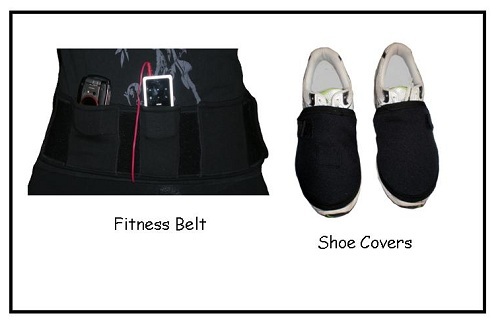 You can purchase the shoe covers and fitness belts at: http://embracedinco660.corecommerce.com/Solutions-for-Everybody-c5/. Enter coupon code “Half Off Shipping” for $5 shipping (US and Canada only, First Class mail, fitness products must be purchased with order). Hi everyone. As the title indicates, I’m finally back after about a month of silence. Of course, I can only blame the infamous “Holiday Season” for my absence. We are also back, literally, from our most recent adventure to Orthotic Solutions in Fairfax, VA. The new banner for my blog shows a picture my daughter took with her new camera, out our front windshield – a significant memory of our 24 plus hours of driving last week. We were very fortunate, though, to combine our two days with Luke at Orthotic Solutions with a family wedding in Richmond, VA on New Year’s Eve. We had a great time, but it was a real whirlwind trip!! In terms of Scoliosis news, my daughter has a shiny new leopard print brace to continue to abate the growth of her curves, and my son is the proud owner of a blue snakeskin print – now I officially am Mother to two WILD ANIMALS! 🙂 Seriously, the good news for us was that Luke wants my son to go from 22 hours a day to 12 in-brace. My son surprised Luke by asking a question he had never heard before – “Do I HAVE to wear it an night, because I WANT to wear it to school.” Now, I know my son just does not handle change well and he probably was just processing things in his head. I figured he would change his mind. And, he has. Luke thought it best he wear it at night anyway because it was starting to concern him that my son’s flexible spine may have overcompensated a bit, pushing his left shoulder up a bit akwardly. My son’s curve has dwindled a LOT since we started aggressively bracing him, so we think this will be a good idea to try and significantly reduce his time in-brace, while allowing his body (and gravity) to re-center after his curve reduction. My daughter had a slight case of the “jealousies” at his news, as we know that she will probably never get the news that she can reduce her time in-brace. She is slightly disappointed by this, but not too much – in fact, after letting her stay out of brace for the wedding for several hours, she declard that her back felt “too loose” and she was ready for the brace to get back on! 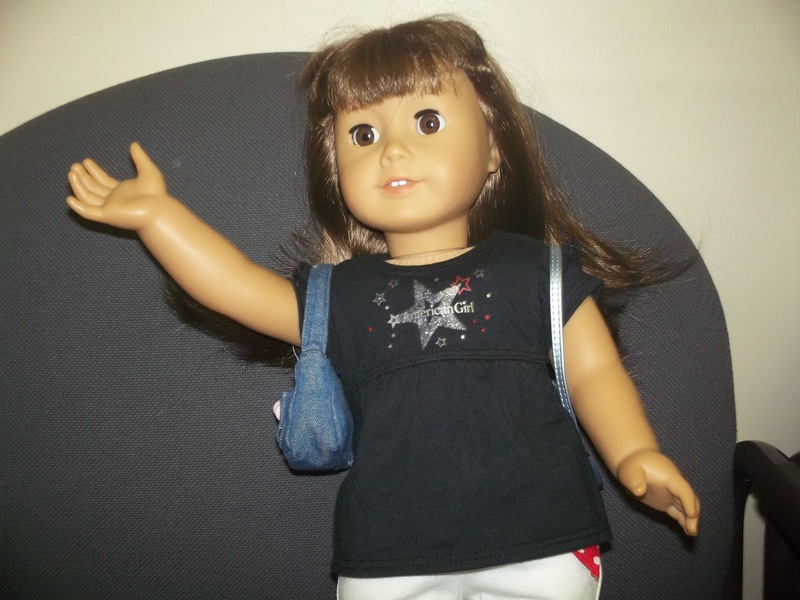 She didn’t even need any Motrin after this new fitting – she’s a pro by now! Our experience with my son has just emphasized to me, once again, how important it is to act early when it comes to Scoliosis – and to check kids at a younger age. Most people reading this blog already have a Scoliosis diagnosis, but my hope is that all parents ask their pediatrician do do a check at every well child visit! We did with our son, but didn’t even think about it with our daughter, and found hers late. And, then we just did the “wait and see”. Well, I’ve been quite vocal about that approach many times, but here it is again: don’t just wait and see! Act early! In other news, I’ll be headed back for my second semester of classes at Central Michigan University, working toward my Master’s in Apparel Design and Textiles, as well as tending my growing business and busy family. My husband continues to work long days as our rural Middle/High School Principal AND Athletic Director, but he’s added yet another hat this winter – head coach for the Girls Varsity Basketball team. So, we essentially NEVER see him. Probably another reason for my delay in blogging… 🙂 I plan to get back on my regular writing schedule, bringing you new and informative topics, new information on previous topics, as well as my standard ramblings about our personal adventure through the world of Scoliosis. So, please keep coming back and reading, and posting your comments – I love to hear from you! Violet waits the day away at Orthotic Solutions with the rest of the family.